How would I know what to look for? Since no search function is provided on their websites to access their standard charges by any of the hospitals, I had to structure my own searches within an Excel spreadsheet using a “filter” on the charge-description column to find any or all billable item descriptors containing the word “stress.” (If you do not understand what I mean by this, do not bother opening up the chargemaster files!) Even if the user is facile with Excel or other spreadsheets, this was not as straightforward as one might think. For example, the lists from Jewish and Sts. Mary contain atypical, non-printing characters that defied attempts to sort or seek. [I devised a multistep technical work-around that most real-world users would have trouble with!] After coming up empty with searches for ‘cardiac’, or ‘heart’, it turned out that the magic word was “stress.” (A user would need to know enough about medicine and medical billing to ignore the other kinds of stress tests that pop up with this search word.) I must confess that I am not at all confident that I found all the relevant items I would have needed. In my opinion, even a professional medical billing person would not find enough information in these chargemasters to predict how a patient’s final bill would be structured let alone what it would cost. Some research on my part was necessary to make more sense of things but the result was only additional layers of confusion. What is a Cardiac Echo Stress Test? Of course by now, I have already had one variety of the test. It involved showing up at a hospital outpatient office wearing athletic attire. I had a baseline (resting) cardiogram and cardiac echo which can show my heart and its valves in motion. The echo (ultrasound) was done through my chest wall. I was given an intravenous injection of a lipid -containing product (Definity) that shows up on the ultrasound (echo) outlining the heart chambers and enabling the operators to measure chamber size, motion, and the thickness of heart-muscle walls. With a multiplexity of wires still attached to my chest and an I.V. in my arm, I was then transferred to a treadmill on which the speed was progressively increased. The nurse/technicians continuously monitored my EKG to make sure there was no signs of ischemia (insufficient blood flow to the heart muscle itself). When I got to the maximum speed of the test and/or heart-rate for my age, I was quickly assisted back onto the examining table where another cardiogram, cardiac ultrasound, and injection of contrast material were performed. When I eventually saw the report, I was amazed at the amount of detail that can be captured. I could only think back to my training years when we had to guess whether a heart murmur was significant or not; or whether perceived chest pain was coming from the heart or elsewhere; and when we had little more than physical inspection of the chest wall, neck veins, or plain x-rays to estimate heart size and function. We’ve come a long way baby! To make any sense whatsoever out of the numbers provided by the hospitals I had to do some on-line research. Simply Googling “billing for cardiac ultrasound stress test” brought up an overwhelming amount of information– mostly confusing to me. Charges depend on whether or not the ultrasound is done through the chest wall or through the esophagus; whether or not the electrocardiogram monitoring is done continuously or only at both ends of the stress; whether or not the “stress” is administered by exercise or by a drug that stimulates the heart directly; whether or not contrast material is administered; what kind of contrast materials is used and whether or not it is billed separately; whether the test is done in a provider’s private office or in a hospital facility where it gets higher payments; for the creative billing talent of the provider; and perhaps other things not apparent to me. Different combinations of these factors determine what CPT billing code would be used (and paid for) by insurers. There would be additional charges facing a patient for the test including cost of the specific contrast agent used, physician fees, other x-rays and tests, and who knows what else! Cardiac Echo Stress Tests in Louisville. I include a list below a list of all of the descriptors I could find for the hospitals in this survey (and a PDF document with the data). I doubt I have found all the relevant items. • None of the hospitals used the same words or abbreviations for the item descriptors. Even for identical descriptors there can be different prices for the same hospital! • Lots of abbreviations will be confusing to many: TTE= Transthoracic Echo; US= Ultrasound; W= With; WO= Without; HC= I don’t know! ; Dobutam= Dobutamine (a drug); ECG= Electrocardiogram; DOPPL= Doppler (a kind of echo). Although the prefix “cardio” appears in some of the descriptions, the word “heart”or “cardiac” is not used. • Although Jewish Hospital and Sts. Mary & Elizabeth operate under the same Medicare provider number and are considered by Medicare as a single financial unit, it is apparent that from their charge masters that different descriptors and prices are used. • Baptist no longer appears to have the lowest charges in town as it did in the 1990s, at least for this service. If we use the listed charge as a possible general indicator of how high a given hospital is bold enough to charge, then there are major differences between our local and university hospitals. Only the two University Hospitals posted charges for at least one version of the test that exceed $4000. (These are the hospitals in this group whose patients have the least ability to pay!) Baptist was not far behind with charges that mostly exceeded $3000. At the lowest end of the standard charges was Clark Memorial at $1684. Jewish and Sts. Mary & Eliz were somewhere in between. I could not find an entry for Norton Healthcare using their chosen presentation format- and I tried! Does that mean that folks with an option should go to Clark Memorial, or for that matter to avoid the University Hospitals or Baptist? Not necessarily. One issue is that there will undoubtedly be associated charges with the basic stress test procedure. These will include physician and operator fees, charges for drugs and intravenous administrations, and other add-ons that can be significant. I suspect these things are unknowable in advance to mortal beings. They were to me. The final charge will almost certainly be higher, perhaps considerably so as mine was. It is important to consider that there are no indicators in these tables of the quality of the services offered or the experience of the providers with the service. Nor is there any reason to assume that the more expensive, the better the quality or outcome. Medicare not the only third-party payer that sets prices. I could not have summarized better myself why the mandatory posting of standard charges by the current federal administration makes no sense at all if its purpose if to allow citizens to make intelligent decisions about their health care. The obvious follow-up question I have is why do we allow such an obviously insane system to exist? If it has any benefit, what is it and for whom? Is it really true or is it a lie that no one is billed for, or pays full charges? ‘Standard Charge’ is an oxymoron, or at least a gross distortion of the English language. Perhaps ‘standard gouge’ would be more accurate. Medicare provides a public-use-file yearly for payments to physicians and other providers in the fee-for-service portion of Medicare. Every individual service performed by a given named provider more than 10 times is itemized, including number of times billed, total charge submitted, and the amount allowed by Medicare. In 2016 Kentucky, Medicare was billed by physicians for 3,513 cardiac stress echo tests. These were split about evenly between CPT code 93350 and 93351– the latter including continuous monitoring and which pays a little more. There were only about 40 individual providers listed for each code with some providers who used both codes counted twice. If the test was done in a facility other than the doctor’s office, the average charges submitted to Medicare were $225 and $231 for the two codes respectively. However, Medicare allowed payments of only $69 and $83! If the procedure was performed in the providers private office using their own equipment, and not in a hospital or other outpatient facility, the average charges were $224 and $598, and the average allowed payments $107 and $235. It is well known and controversial that Medicare pays more to hospital’s off-campus outpatient clinics for the same procedure than if it done in a private doctor’s office. 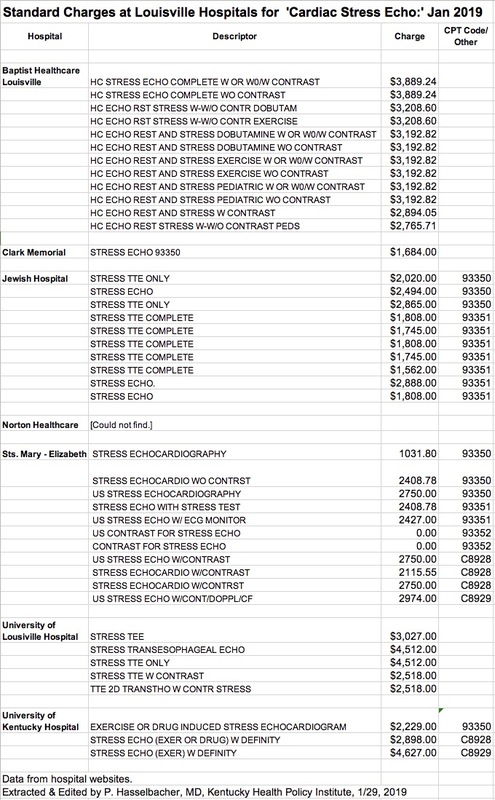 Thus, we can assume that Medicare pays a hospital more than $235 for a cardiac echo stress test, but how much more is not known to me. I have probably numbed-out your minds with all this detail. It took me a couple of days to organize things even this far but I still have had nothing better to go on should I need to have this procedure again. I conclude that the mandatory posting of standard charges would not even allow a professional medical coder to be able to predict a patient’s bill from the data presented. I am now confident enough to tie a tag on the toe of the chargemaster system as having no utility to a patient and to start shoveling in the dirt. All this was no secret to the US Department of Health and Human Services or its Health Care Financing Administration, nor to hospitals themselves which argued strenuously against the mandate. One can only speculate why this small part of Obamacared was pushed forward at this time. As far as I am concerned, the only value to the initiative is to embarrass hospitals for billing outlandish charges to those least able to pay, and to shame the rest of us for allowing it to happen. Previous Previous post: Federally Mandated Postings of Standard Charges by Louisville Hospitals Are Unusable for Their Intended Purpose. Next Next post: Kentucky’s Hepatitis-A Epidemic: Could We Have Done Better?